This trendy backpack is perfect for everyone. 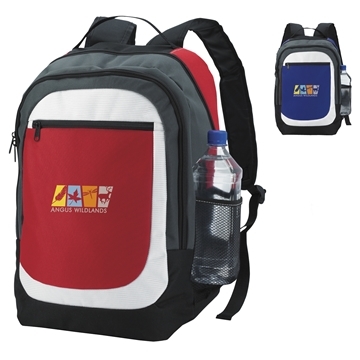 The large front color panel provides a great imprint area and the ripstop fabric adds style to the bag. The 2 large zippered compartments and mesh side pocket provide ample storage. The padded shoulder straps and back ensure maximum comfort. Padded shoulder straps and padded back panel. The product is simply what we wanted and it is very well-liked by our employees. We needed to experiment using the logo design but could fit our large logo design on two lines it looks good. We all agreed it was of terrific quality with fabulous styling. Imprint came out very clear and nice.